We have heroes around us that change the way we think and set our goals. Every champion that we see have one thing in common and that is the way they think. Their mental power that drives them to achieve what they aim for, comes out of the world. The level of motivation and the visualization of them succeeding, gives them the glory. 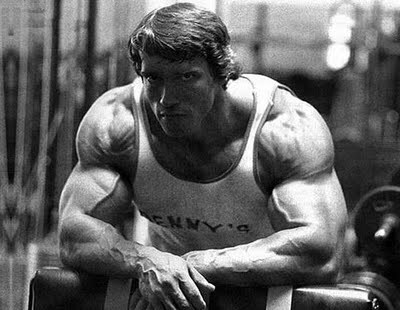 One such living legend, is non the less Arnold Schwarzenegger! Former bodybuilding champion (7 times Mr.Olympia), a Hollywood most paid actor in his peak times, the greatest action movie actor (Terminator 2 being one of his famous movies), and a former governor of State of California. I have been into bodybuilding from couple of months now, and just as blogging, i needed motivation for my body exercises too. It was Arnold, who made me feel like that i need to go gym every second that i was in my home. One of the video clips that really pumps up being a champion is what ill be sharing with you guys. Not only that it bring us motivation toward bodybuilding, but it has a great deal of advices for the Blogger community. Most of the beginners lack the motivation to succeed in what ever they want to do. Being a mediocre in our life doesn't give us any fruits as opposed to being a champion in a particular set of field. 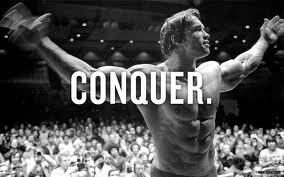 Today we would interpret those words of wisdom from a Legend, Arnold Schwarzenegger! Being competitive is one of the most important aspects of our success. The thirst to go and break the boundaries, is what takes these champions further than any one before. "When you are competitive athlete you learn very quickly how strong you are. There are many people that have equaly good body as you, with equally good proportions as of you, but the question arises that what puts you over the top?... It is the mind that really makes you work out 4-5 hours a day." It is the mind that visualizes the finished product!" 2- Visualize Where You Want Be! To me, its the most important aspect of getting success. Life is meaning less without the goals. 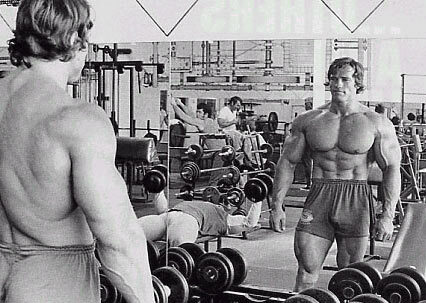 As per Arnold, its the mind that visualises the finished product. First set your blogging goals. Say you aim to become the best blogger in the world. Obviously there would be people that would laugh off, but just don't listen to them, as per Arnold there had been 'No sayers' in every turn of his successful life. There were people that laughed off him when he used to say that he wanted to be the best bodybuilder in the age of 15! Then there were people who used to say that he could never become a great actor in Hollywood as he had the most awkward accent that any one could have. The kind of huge body with 'bumps' wont let him be the next man in Hollywood. He proved them all wrong! Arnold believed in the theory that when ever any one says that something cant be don't, just do it and tell him that you have done! That's the way he lived. 3- Speak Your Heart-Don't be Shy! What to shy off? When you are on the top, people automatically provides you the space that you need to live. Arnold believed that even if you have the best idea in the world and you just cant speak it, its worth nothing. Reaching out to the people and addressing them your mind is one of the key aspects of success. Same applies to blogging. We should never be shy off trying out new ideas on our blogs, and socializing with other great Bloggers, attending conferences. Arnold used to conduct seminars during his bodybuilding peak and that also gave him much popularity among the crowds. To note, media was still young back then. First ask your self, that why you want to be a Blogger? If one thinks that, may be he could write posts on his blog and that may bring traffic to him and he might get success. Then for those, Arnold's says, "Sit Down!" He believes that there are no if and buts in hero's life. One should get up and say, OK this is needed to be done! Only such an approach would bring positive results. And that's what a bodybuilding legend showed us all during his entire career. Being 7 times Mr.Olympia is what many top bodybuilders still admire! Arnold achieved that decades back! Do what ever it takes to be the pro blogger. Read motivational articles, watch inspirational movies etc. Give your self a one step push toward what you aim to achieve. If you're not going to set a goal for your future, than who else would? Its you, who needs to think off as a champion. Every 2-3 hours that you would put into blogging would make you bring many steps closer to what you aim to achieve. Every single post that you would write would bring you closers to become a Pro Blogger! Every Legend that we have seen in our lives were never afraid of failures. They simply popped into what ever they aimed for. Thinking of failures wont let you live as per your dreams. "The people who have grown are the ones who didnt really cared. They gona take their risks and thats what you gota do." Once the success starts to touch your toes, never let it come over you. Never Ever. Instead think of every new dawn as a new learning experiance of your life. Even a 100 years old has so much to learn every day. Indeed Anrold has made a difference in my life, as being a blogger, or just a succesfull person. No matter what we do, we can apply all these golden set of rules and tips that Arnold has left for us. Watch the actual clip that sums up the entire post and indeed that would pump you up!